J’aime toutes les laines Merino conçues pour les chaussettes, mais c’est confirmé: j’ai un faible particulier pour Koigu. Et ce n’est pas que les couleurs, le fil est élastique, souple et tout doux, même dodu! Cette paire est tricoté d’un seul écheveau. Je suis aussi surprise que vous, je ne pensais vraiment pas en avoir assez! Je les ai tricotés presque deux à la fois, commençant par les orteilles et travaillant un peu sur le premier, ensuite sur l’autre, jusqu’à l’épuisement de la laine. Aucune idée de l’origine de la laine aubergine, mais c’est fort possible que l’ai teinte avec la poudre RIT. La prochaine fois que tricoterai des bas en commençant par les orteilles je vais devoir utiliser une technique différente pour éviter le bout triangulaire. Heureusement que quelqu'un a déjà résolu le dilemme! There’s just something about Koigu, isn’t there? 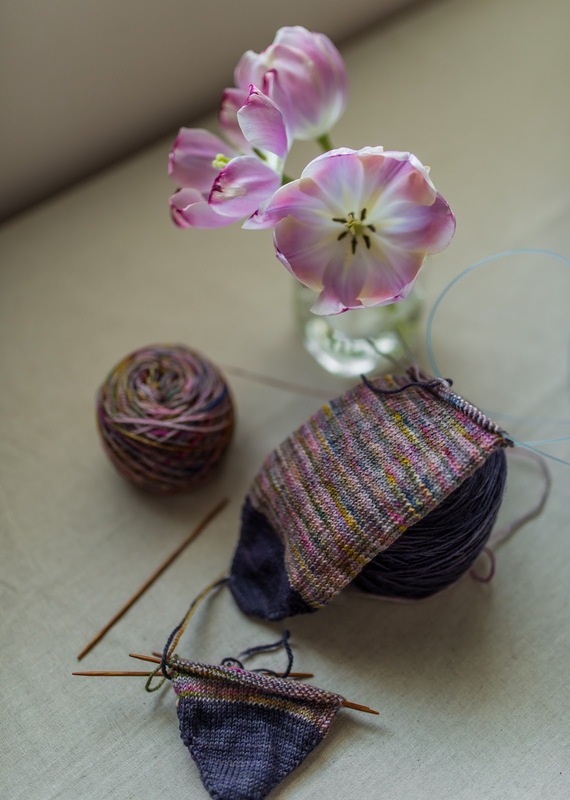 I love ALL merino sock yarns, but there is something so delightfully springy about Koigy’s KPPPM. 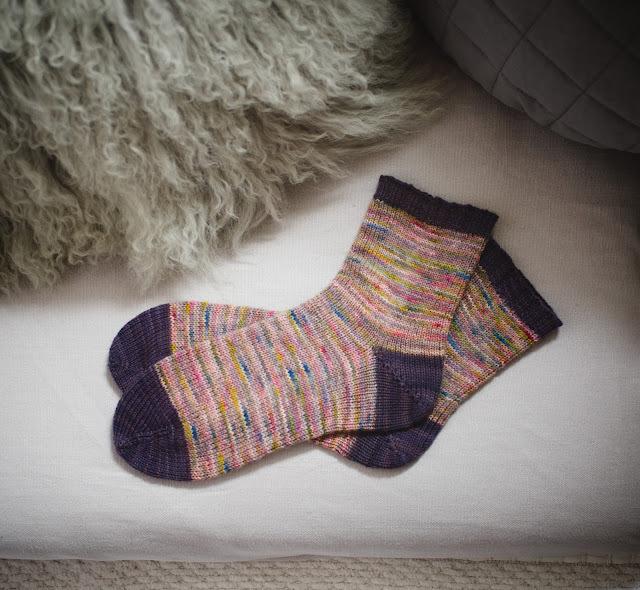 These socks were knit from a single skein of KPPPM, a treasure plucked from a sale yarn bin many years ago. I wasn’t super confident I’d be able to get a complete pair out of just one skein so I knit these toe-up, working a few inches at a time on each sock separately until I ran out. 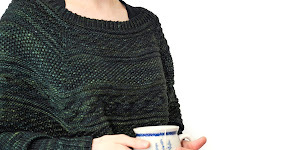 I’m impressed with how much cuff I was able to squeeze out of that skein! I have no idea what brand the dark eggplant yarn is, I think it might have originally been a pinky-lavender skein of Smooshy that I overdyed with black Rit dye. This was my first time trying a wedge toe shape and I don’t think it’s a perfect fit for my toes. My favourite toe shape so far has been the round toe, with decreases similar to those you would do for the crown of a hat. I’ve loved using it for cuff-down socks and thankfully there is a round-toe toe-up technique out there! HOWEVER! 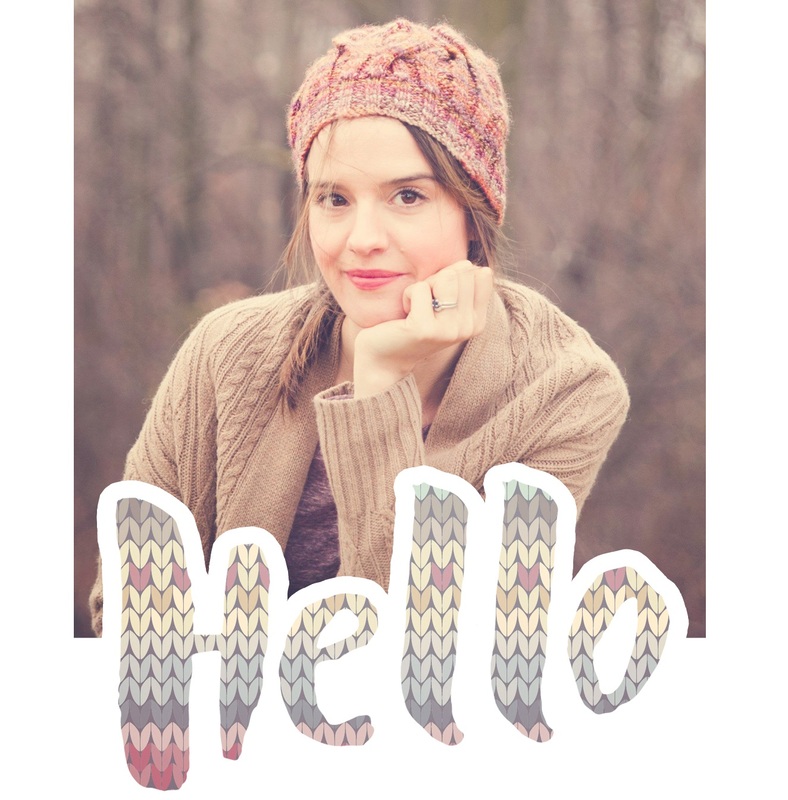 Fellow Canadians, should you hear about a Koigu sale will you pretty please pass the info my way? Every yarn-buying ban needs an exception! Those are lovely! Thanks for the inspiration! Such stunning socks!! And I agree, Koigu has been doing colour in such a stunning way for a loooong time, they totally know what's up. 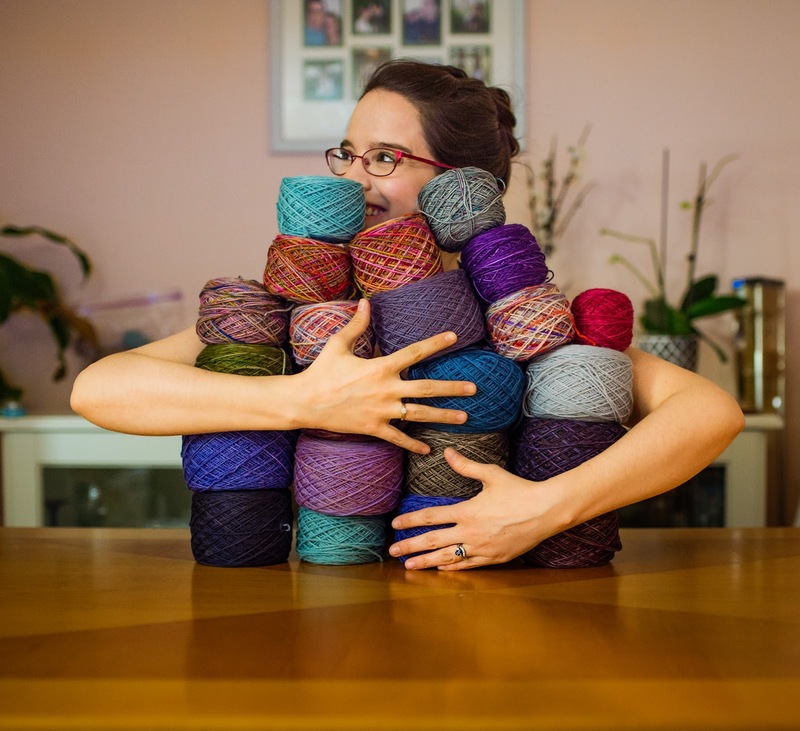 Love that photo of you hugging your sock yarn, too! squares I knit adding to my blanket - just so simple - stocking stitch made with rescued yarn remnants. Still I can dream in seeing all the marvellous things you make. I love the photos always. BTW this is M's Auntie Ruth. HUGS for you both!